Tools: drill press, spade bit, belt sander, japanese saw. I made the body of the ring from komatex, closed-cell PVC foamboard. We use it a lot in my job. It machines very nicely but doesn´t split as the wood does, especially thin wood. I first approached my favourite tool, the drill press and used 20mm(3/4") spade bit to bore a hole for my finger. Then I removed most of the remaining stock using japanese saw. After this step I used belt sander with P40 paper and shaped the body of the ring. After I made the body nice and curvy I used smoother sandpaper to give it better finnish. For sanding the hole I rolled the sandpaper. As it tried to straighten, it filled the hole perfectly. Finally I used 17mm(11/16") drill bit for metal to drill a hole on the top. Anyway, after the epoxy was cured I used my belt sander again to shape the "stone" to rounded shape. Then I glued the yolk in the hole drilled previously. 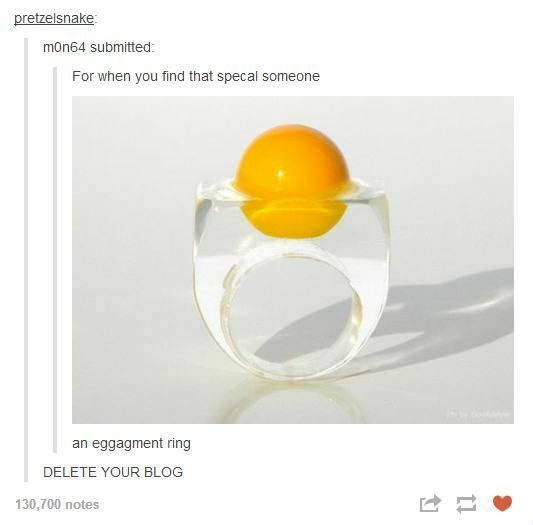 This was short and funny project to make, I was inspired to make the eggagement ring by post from Tumblr. You can easily make it too, even if you don´t have the materials I used. I would actually be very interested in how would the ring look using different materials, so let me know if you make it! As always, thank you very much for reading, please subscribe to my YouTube channel, I post project video like this every thursday and workshop tip video every monday. See you next week with new project and don´t forget: get inspired, use what you have and make the best out of it!